Take Advantage of Our Valentine’s Day Promotion! Looking forward to spending your Valentine’s Day with your sweetheart, some delicious chocolates and wine, and a ton of thematic movies and shows, but are bummed out you have to settle for mediocre choices because all the best stuff is geo-blocked? 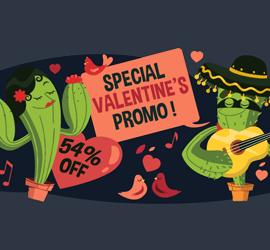 No problem – this Valentine’s Day, we decided to offer you a nice discount of up to 54% on all our services, so that you and your loved one can enjoy all the Valentine’s Day movies and TV series you want, no matter where you are in the world. So, make this special holiday much more enjoyable with our promotion – maybe even get a subscription for that special someone in your life as a nice Valentine’s Day present. And don’t forget to let your friends and family know about this promotion – especially if you know they’ve been looking for an easy way to enjoy more online entertainment.